Don't forget about my GIVEAWAY, happening now until December 2nd. (Link at the bottom of this post.) There will be 10 winners, and each will be sent a free copy of my new nail art book, Pretty Hands & Sweet Feet. Best part? It's open internationally! Now, the inspiration for today's nail art actually came from the aforementioned book. 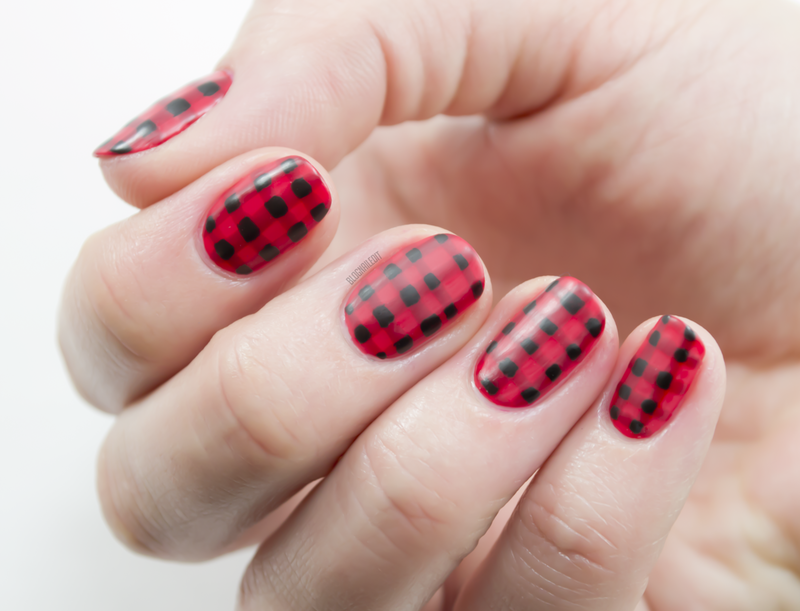 Sarah contributed a fantastic tutorial (which also wound up on the cover) that teaches you how to get a cute plaid look. I combined that tutorial with inspiration from Jessica Washick, a nail artist in NYC, and made this Fall-ready look. I don't know about you, but this just makes me want to snuggle up with a cozy blanket, a slice of warm apple pie, and a cup of piping hot apple cider. Mmm! I used 3 OPI colors for this look. Coca-Cola Red as the base, Amore at the Grand Canal and Black Onyx for the plaid detail. I finished it with OPI's Matte Top Coat to keep it cozy. Learn how to get this exact same look through our fabulous step-by-step guide, Pretty Hands & Sweet Feet, available wherever books are sold and through my giveaway for 10 of you lucky ladies (or gents).